A recent study looked at the medical malpractice claims of the 2 largest insurance companies in Massachusetts during five years. The study, published in JAMA Internal Medicine and led by Doctor Gordon Schiff (Brigham and Women’s Hospital’s Division of General Internal Medicine and Primary Care) looks at patterns of primary care malpractice types. During the five years under review there were 7224 medical malpractice claims of which 551 (7.7%) were from primary care practices. Out of these 551 cases, researchers found out that most medical claims were failure to properly diagnose a condition (72.1%). 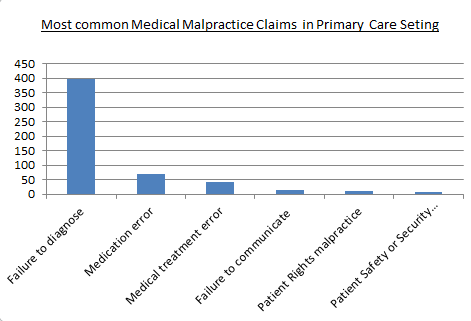 Other malpractice claims were related to medication errors (12.3%), medical treatment errors (7.4%), failures to communicate properly (2.7%), patient rights (2.0%), and patient safety or security(1.5%). According to the author “many of these claims “appear to be due to failure in more routine yet high volume outpatient office processes”. The study also found some evidence suggesting that “outpatient primary care in general and diagnostic cases in particular were less defensible than other malpractice claims because they were significantly more likely to be settled (35.2% vs 20.5%) or result in a verdict for the plaintiff (1.6% vs 0.9%) compared with non–general medical malpractice claims. The study also looks at the nature of misdiagnosis and found that half of them are failure to diagnose cancer.